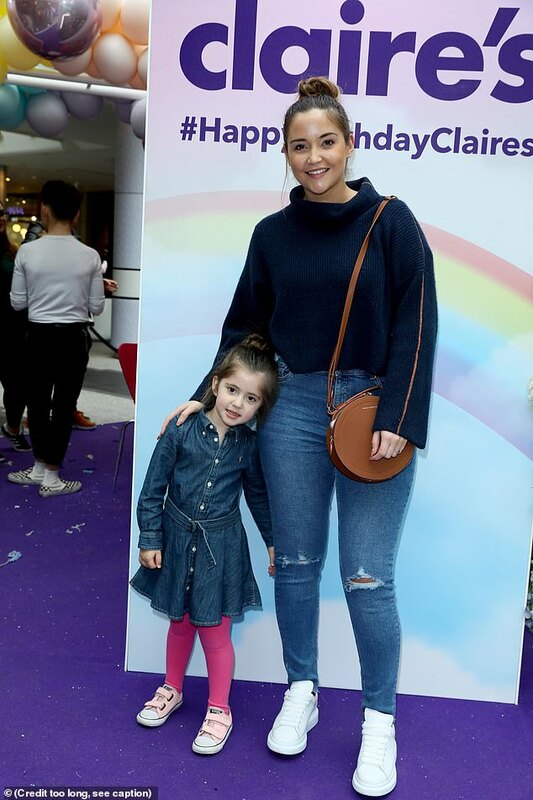 Jacqueline Jossa has continued to hit back at suggestions she took her wedding ring off as she proudly showed off the eye-catching piece off jewellery at a Claire's Accessories event with her daughters on Saturday. The 26-year-old proved she has moved on from accusations made last week that her husband Dan Osborne shared a 'kiss' with Love Island's Alexandra Cane - which they have both denied - as she posed for photos at the Westfield White City store. 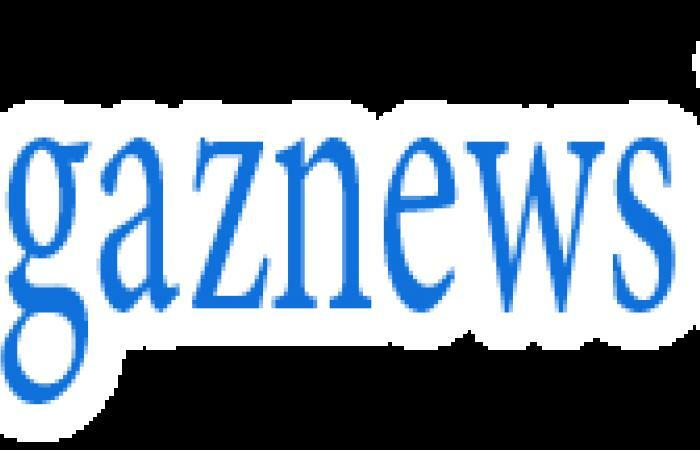 The former EastEnders actress tucked her chic navy cropped jumper into her lightwash denim jeans and carried her adorable eight-month-old daughter Mia on her hip while Ella, four, beamed for cameras. Jacqueline appeared in jovial spirits as she flashed her diamond ring and draped her tan-coloured bag over her shoulder before indulging in a spot of glitter face paint. Continuing her stylish display, Jacqueline worked her brunette locks into a sleek top knot and sported a natural Beauty look at the event, which saw Imogen Thomas, Rachel Stevens and Hollyoaks' Kieron Richardson in attendance. Adding an extra touch of glamour to the festivities was newly-married Billie Faiers, 29, who arrived with daughter Nelly and sister Sam. The ITVBe star looked stylish in a white shirt with a pair of dark denim flares while sister Sam wore a cream-coloured shirt with beige cargo pants. 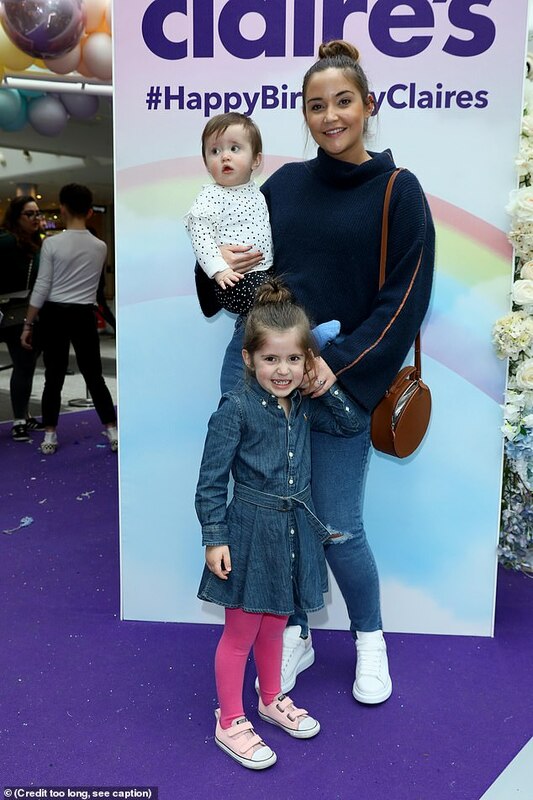 The ITV darlings brought their daughter Nelly and Rosie along for the girly event. Meanwhile, Jacqueline's appearance comes it was said she was fuming after reports surfaced claiming her husband Dan shared a kiss Alexandra earlier this month. The Beauty decided to take a break from all of the drama when she jetted off on a well-deserved getaway to the Culloden Estate and Spa in Bangor, Ireland. In pictures obtained by The Sun, the EastEnders actress was seen arriving at London City Airport with her suitcases to hand with a friend. The glamorous mum-of-two left her children Mia and Ella in the care of their father and her husband Dan while she took some much needed respite time. Dan relished in the extra time with his children as he whisked the girls and his son Teddy, whom he shares with his ex Megan, to Legoland in Windsor.